Five teasers and a payoff generated, over time, millions of dollars in business. Introduce a free-lance copywriting service to an audience of art directors and business owners. 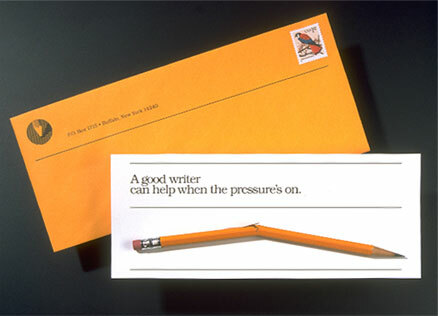 Five teaser mailings featuring chewed, broken, shortened, notched, and double-pointed pencils were followed by a brochure revealing the sender's identity. 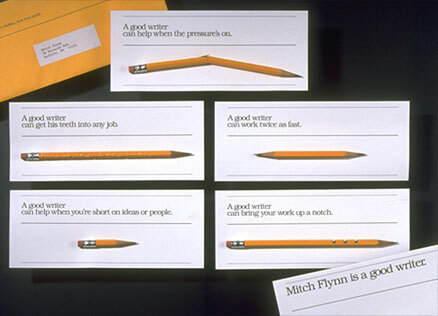 The campaign won Best of Show from the Professional Communicators of Western New York, and launched the business that became Flynn & Friends.